We have another incredible America’s Got Talent performance that had even Simon Cowell grinning ear to ear. This time? 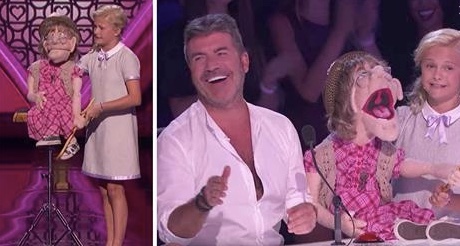 It’s a 12-year-old girl, her act is going to make Simon blush in the most hilarious way. Darci Lynne is one of the most talented young ladies we’ve come across in our search for best performances. She’s from Oklahoma City and was about to win over the hearts of everyone in the entire crowd. She’s a ventriloquist and at 12-years-old? She’s really good at it, and not just for a young girl either! Darci Lynne is actually one of the best ventriloquists we’ve ever seen. We’re a talent website, so we’ve seen a lot! We’ve shown you a previous video of Darci Lynne, but we think you’ll like this one even more. She’s gotten so much better since you last saw her. Plus, who doesn’t want to see Simon get a little pink in the cheeks? Continue to the next page to see Darci Lynne’s performance that has the internet in stitches. Her puppet this time? A naughty old lady! She was awesome. Great entertainer. So glad she won. That was awesome. God bless her. She is great talent and can sing very well too. She deserve to win this competition. I can see why she won! She is great! Espectacular e maravilhoso….! Ela mereceu a vitória. May god help us t spread peace. Amazing Amazing Amazing gerl Congrass!!!!! First time she was on, I said, she will win AGT. She is so GOOD!! Way to go Darci!! She is the best I have ever seen.